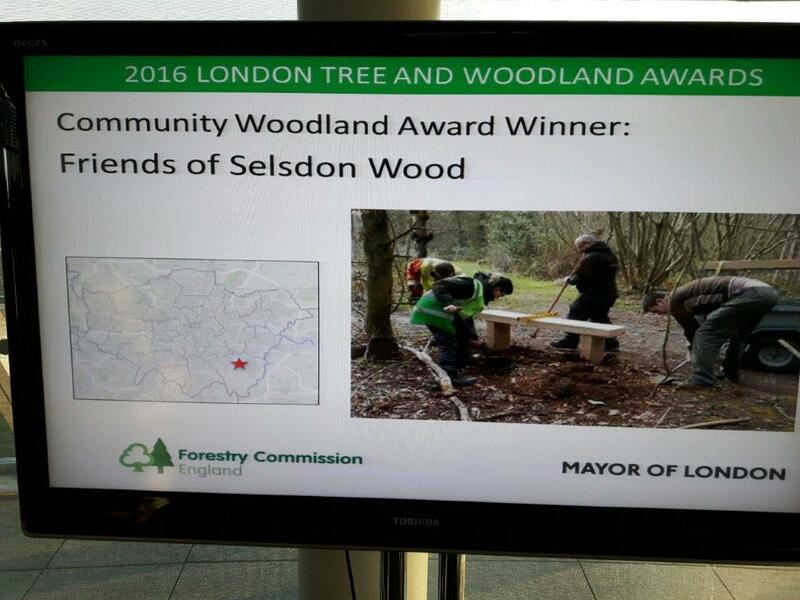 The Friends of Selsdon Wood are delighted to announce that we have won an award from the Forestry Commission for being a community group that works effectively to protect and develop London's trees and woodland. We were nominated by Mathew Frith of London Wildlife Trust who submitted the nomination shown below. 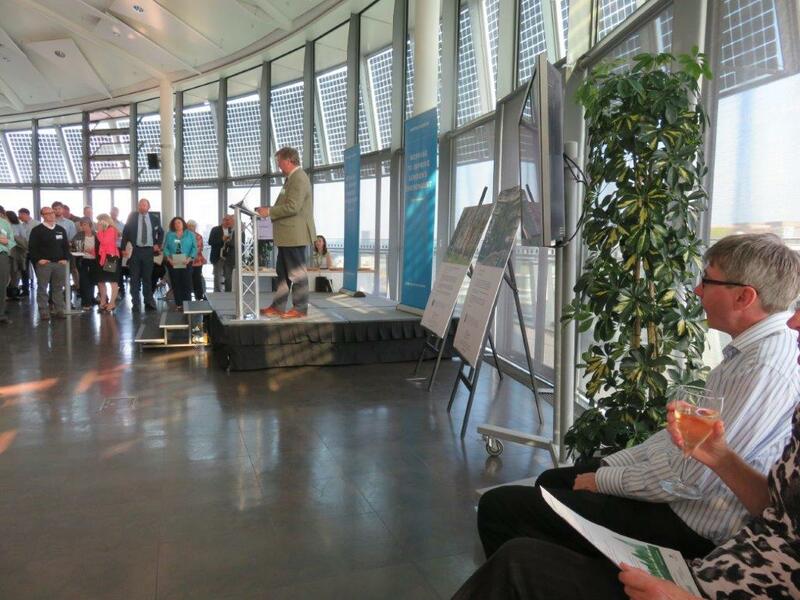 We heard on 6th May 2016 that we has won and were invited to attend an event at London City Hall to receive the award. 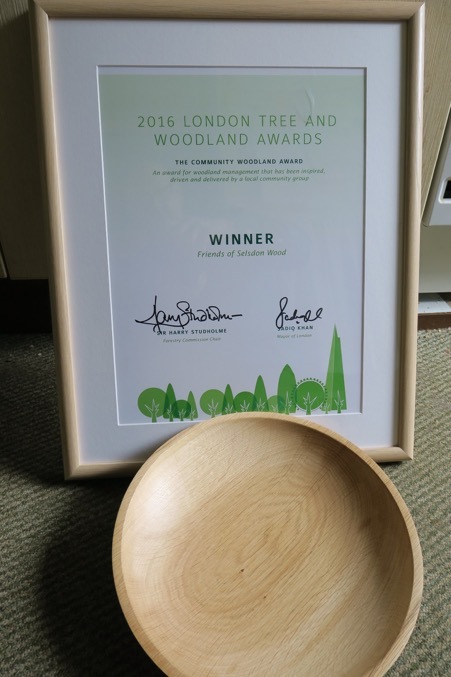 A group of active FSW members attended an awards cermenony at City Hall on Thursday 26th May 2016 at which we were presented with a certificate and a wooden bowl - both of which may be seen in the FSW display room by the car park. The photograph shows Linda, Ted, John and Neale collecting the award and an account of the ceremony is given at the bottom of the page. The Friends are a very active group of volunteers and have done a significant amount of work both in the Wood and outreach into the communities of Selsdon and Forestdale that live adjacent to the site. The Friends’ Chair, Heather Govier, has created an engaging website which now has hundreds of photographs taken in the Wood, including details of every tree species. She also produces a monthly newsletter, often containing pictures of natural history items to look out for during the following month, and since 2010 has held an annual Photographic Competition. Ted Forsyth, Vice-Chairman, organises the regular workdays, writes monthly Nature Notes for the Selsdon Gazette, leads a few walks and surveys birds, butterflies, fungi, etc. David Malins organises many projects, including name boards for the network of paths, has updated the two self-guided walk leaflets and has set up two trails which are accessible on a mobile phone by way of QR codes. Linda Morris makes sure the Friends’ Open Day is a success each September, when they recruit new members, raise funds for the work in the Wood, and promote its wildlife to visitors. Linda, Neale & Karen Fox, Jim Dunning, Alan & Janet Bushnell are regular on the workdays and a few others join them frequently. A few years ago the Friends cleared out ash and sycamore from the Jubilee Plantation and planted around 250 trees of 20 species, and for the Queen's 60th anniversary they helped a Brownie pack to add another 60 tree whips in the same area. The intention was to create a bird-friendly area to provide nesting and feeding when the trees mature. 100 hazel whips, 6 wild service-trees and 6 disease-resistant elms were recently planted in an area which we had previously coppiced. The Friends work closely and constructively with Croydon Council officers to ensure that the Wood is maintained for the benefit of the flora and fauna. What makes their work impressive is the breadth of activity and the partnership with Croydon Council; the Wood is of significant size and through partnership working it is clear that the site is being given the care it deserves. (The nominator has known the Wood for almost 50 years, and has noticed the positive changes in the past 15). Linda Morris. Ted Forsyth, John Zareba and Neale Fox met at East Croydon to catch a train to London Bridge. 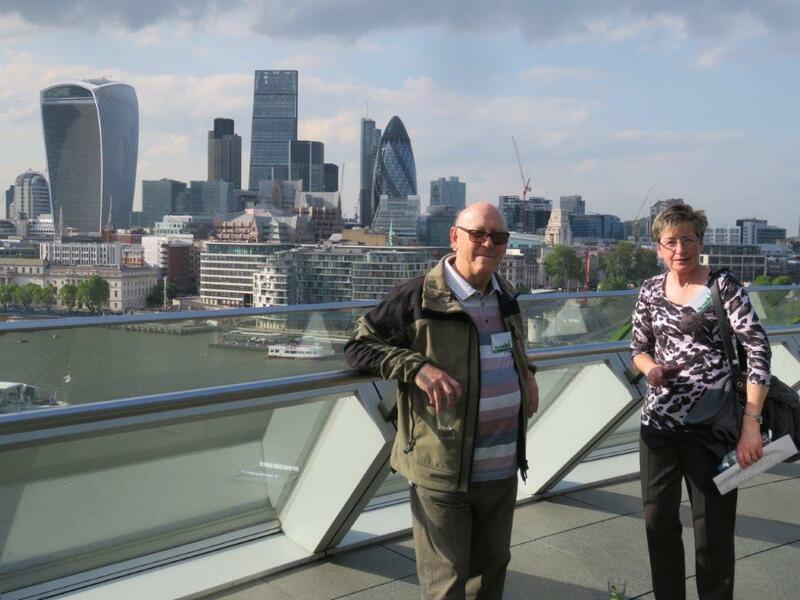 A walk down Tooley Street took us past The Shard and to City Hall, close to the Thames and Tower Bridge. Inside City Hall we went to the registration desk where they could not find prepared ID tags so had to scribble out four new ones. We then passed on to security, just like an airport security check, where we had to remove jackets and all metal including watches and trouser belts before being allowed through the gate. 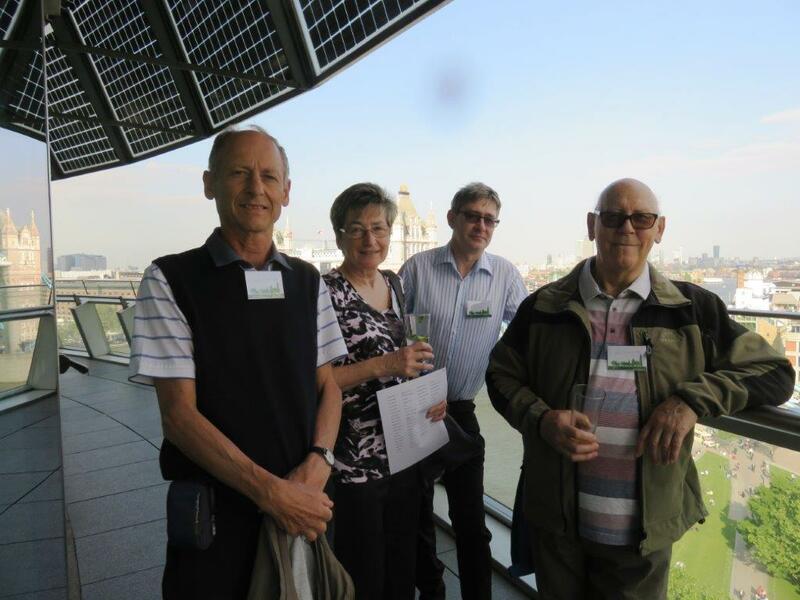 A lift took us to the ninth floor to the large “London’s Living Room” where tables were covered with filled glasses of wine and fruit juice, and with a selection of nibbles. We went out on to the balcony to admire the views over London, and took the inevitable photographs. The room inside gradually filled with around 100 people and the noise of conversation became intense. At some stage Richard Edwards, tree officer for Croydon, came over to chat and I later had a chance to ask about the Ash dieback recently discovered in Selsdon Wood. Eventually the formal proceedings began, compered by Tony Kirkham, with whom we had come up in the lift. There were addresses from Leonie Cooper, Chair of the Environment Committee, and from Sir Harry Studholme, Forestry Commission Chair. 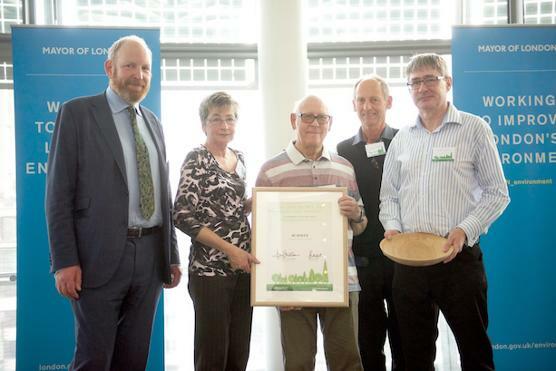 Tony then introduced a group of winners, with a brief comment about why they had won their award – they stepped up to the platform and were presented with a framed certificate and a wooden bowl, photographs were taken, then they returned to the floor – all within about three minutes. We were the second group. After three groups had performed for the audience there was a pause while we watched a video about one scheme involving people planting trees, followed by the remainder of the awards (for which there were six or seven categories). Several lycra-clad cyclists then took over the platform to talk about their cycle ride to Paris where they will deliver the French translation of a previous English publication about urban tree renewal. Tony recounted a story of a time when he was helping to plant trees and was with a 12-year old girl. To encourage her he handed over a £1 coin and suggested she drop it into the planting hole before dropping in the tree. She paused and held on to the coin before reluctantly dropping it into the hole. After a further pause she asked if all the trees had coins underneath (they were starting to plant something like 10,000 trees) and there was another pause as she contemplated the implications. Tony wondered how many trees would be uprooted in the search for hidden treasure. Waitresses and waiters wandered around the assembly offering small containers with lettuce, croutons, etc, followed later by another small pot of chips and a breaded stick of fish, then an unidentified pot of something else. The small tables dotted around still had bread sticks, peanuts, wasabi nuts, crisps, etc, and glasses were topped up from time to time. 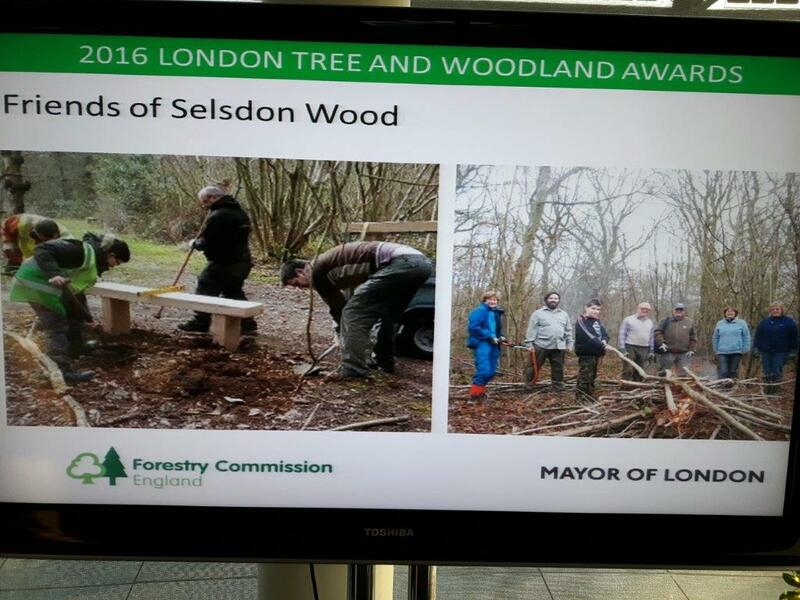 There were several pictures on display, showing tree-planting related items, and on the video screen there was a running display showing pictures and text relating to each of the award winners. The Selsdon Wood display included pictures showing David Malins standing beside the new information board in the car park, one of David’s adverts for one of our events, another picture of Scouts putting in a new bench, an old photo of our group including Gordon Endersby, etc – with suitable text as well. Around 8.15pm our group left, carrying with us the 43cm x 53cm framed certificate and the 29cm diameter wooden bowl. We strolled back to London Bridge, to East Croydon, and home.